Welcome to Diehl Volkswagen of Butler! 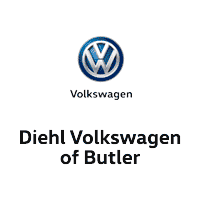 Diehl Volkswagen of Butler is a proud member of the family owned Diehl Automotive group. Diehl Automotive is passionate about customer service. Everything we do-from reconditioning to diesel engine repair-is done with the customer in mind. Diehl Automotive’s service center caters to all vehicles of all makes and models. With over 20 service bays, dedicated lube bays, diesel-specific bays, our service is always quick and efficient. We employee over a dozen master technicians and keep abreast on all the latest service technologies. In addition, Diehl features a world-class waiting area with wifi, laptops, tv, free coffee and popcorn, and a vending area for a relaxing experience while waiting for your service. We also feature drive-thru service lanes, so when you drop off your vehicle, you don’t have to do it in the rain. Diehl’s sales department puts the customer first. Our professional sales consultants listen to your needs and help you chose a vehicle based on your qualifications. We make your visit with us comfortable and expedient. The parts department at Diehl Auto is a cut above. With a million dollars worth of parts and accessories in stock at any time, there’s a good chance we have your part in stock. If not, most parts orders have a 24 hour turn around, so there’s a very good chance you’ll have your part the next day. In addition, our parts consultants are some of the most professional in the area, with decades of experience and knowledge. Diehl Rental will put you in a rental car today! With many late model vehicles to choose from-from sub-compact to full-size trucks-we have you covered. Diehl Collision Center features state-of-the-art equipment and proficient technicians. From dings and dents to complete rebuilds, the Collision Center does it all. Featuring new technologies like Plasti-dip paint jobs, the newest in undercoating, and even spray-in bedliners, our collision center is one of the top shops in the country. Diehl reconditioning will keep your car looking brand new. From a wash and wax to a complete detailing, Diehl Reconditioning does it all. Our detailers have the experience and knowledge to turn a junker into a looker. Thank you for visiting Diehl Automotive, proudly serving Butler, Cranberry Township, Meridian PA and all of Western Pennsylvania. Whether you’re from Butler, Cranberry Township, Gibsonia, Wexford, Pittsburgh or anywhere in between, you can rest assured that when you shop for a new or used Volkswagen, you’re shopping for quality and reliability, no matter which model appeals to you. Ever since incorporating a former VW dealership into the Diehl Auto family our commitment to local Pennsylvania drivers has been clear. Our goal is to provide an incredible car ownership experience every step of the way. That’s why qualifying for a loan or Volkswagen lease couldn’t be easier with our on-site financial enthusiasts at your back. We know all of the ins and outs of finding quality financing solutions, and that means you can spend less time going over paperwork and more time enjoying your new car. Once you’re behind the wheel as an owner, Diehl Volkswagen of Butler continues to support your driving needs through our onsite service center. Our team is well-versed in everything automotive and utilizes the latest Volkswagen parts, so you can count on solid routine maintenance and timely repairs when they’re needed. When you can come to Diehl Volkswagen of Butler, you can have your Volkswagen wishes granted. And let’s face it: you deserve nothing less. Located on 258 Pittsburgh Road in Butler, PA, we know our job isn’t finished until you’re completely satisfied.